There was a time, perhaps when I was seven or eight years old, when I talked to the sky and chattered with birds. I lay in grasses tickling my cheeks; the lush green shoots were a chorus telling me stories. The earth smelled good, so I ate it. I lived in a leafy urban neighborhood, and everything in our yard was friend: the tall linden tree, the hydrangea bushes, the honeysuckle, the dandelions. Then I grew up. I have been trying to grow back down for many years. Growing up was effortless: every person around me cheered as I learned to write school papers, eschew play, preen my appearance and slowly but utterly relinquish the outdoors. By the time I was in college I was a brainy girl at a university in leather boots and turtlenecks who wanted to live a life of the mind. I followed this to its logical conclusion at 28 years old and began a Ph.D. program in American History at Stanford University. I was set to become a college professor and walk the streets knowing I was smart and pithy. Then a random traffic accident severely ruptured two lumbar discs in my lower back. I was disabled for eighteen months. Classes, papers and academic work spun to a halt. With my outer life taken away, my inner life shattered. Familiar things that had kept me focused and very busy were gone. In the emptiness, I feared there was no solid essence within me. In great need, I explored meditation, deep tissue massage, mystical poetry, Eastern religions—and the outdoors. By the time my back injury had healed, I had become a more physically active person, and also more settled in my skin. I looked at my pile of history books and then at my poetry volumes and spiritual texts. I wrote to Stanford University and relinquished their scholarship. I did not know where the path would lead, but at thirty years old I did know I wanted it to be wild, creative and unplanned. That was twenty-five years ago. Ever since, one might say that I have been trying to grow back down to the girl who knew how to talk to the sky. It is said that the famous psychiatrist Carl Jung concluded as a middle-aged adult that he did not know anything as valuable as when he was an eleven-year-old boy building forts. The small boy still had life, he realized–a creative and mythic life he lacked as an adult. He began to spend afternoons building castles and forts with stones. This time, he wrote later, became a turning point in his fate. When I first read Jung’s memoir, I’d just thrown off a potentially lucrative and successful career for an unknown path. I did not think of my own life as mythic or even significant, but I did know I wanted an existence where my younger self could have some voice and authority. Over time I looked for guides: poets, nature writers, indigenous teachers, mystics, the spiritual writers of the ages. But the best teachers were found in the earth intelligences around me: animals, trees, clouds, rivers, all the living beings who did not use words or walk with two legs, but still flowed, cried, called, communicated, rejoiced, feared, lived and died. At times, all that accompanies us–songbirds, whales, thousand-year-old redwood trees, the daily miracle of plants eating light and then feeding the world–overwhelmed me with its beauty. How could such a world–one that is at once both useful and beautiful–have become itself? What were the currencies that held such a world together? On the day I first thought about the squirrels, a virus had moved into my neck and I could not raise my left arm without pain. Still I decided to proceed with a medicine walk of thirty-six hours of silence in the Sierra Mountain wilderness. Two hours after leaving home to drive to the mountains, I saw a furred creature in a lane next to a Taco Bell. I have long been broken-hearted with the raw ugliness of road kill. I pulled over and parked the car. In the brief moments it took to reach the body, the animal was hit and dismembered two or three more times. A limb, a tail, a paw, flew across the lane. I darted into the lane and pulled what was left of the body to the side of the road with my one good arm. Oh, creature. I could not tell what it was: a domestic cat, a raccoon, a fox? I moved the ravaged remains into grasses by the road. At least machines would not dismember him any longer, a flattened splat in the road. At least he would be given to the earth, to the wild birds and insects who transform the dead into soil and loam. I sat with him for a few minutes, tired, my shoulder aching. The sun set across the highway, lighting the Starbucks, Taco Bell and Staples, the strip mall, storefronts and parking lots: the unbeautiful world we have created for ourselves. And I understood. What we do to the animals we are ultimately capable of doing to ourselves. When we left our communion with the other living creatures of the earth, we began the process of leaving communion with each other, and with the sacred. Somewhere in us, we know we are animal. We know they suffer and dream and attach to each other, sometimes for life. We know they feel pain. And we look away. As we so often look away from each other’s pain. The following dawn, the teacher who was leading the medicine walk, a mixed-blood Irish and American Indian teacher named Valerie Wolf, woke us with a prayer song. We were at a lodge in Sequoia National Forest. I loaded my car and began a fifteen-minute drive, in order to walk among a majestic stand of giant redwood trees. Within moments I saw a dead squirrel in the road. A slight thing, a baby. At birth in early spring, infant squirrels have no fur and are blind. They stay with their mothers for several weeks, nursing, curled into little balls, eyes closed. Then they venture forth; just a few months later in midwinter, they are grown and prepared to mate. That is, if they survive their number one cause of death. Not owls, snakes, hawks, or mountain lions, though all of these are squirrels’ natural predators. And not directly humans, though we have hunted, skinned and eaten squirrels for millennia. The primary danger to squirrels is our vehicles. We slaughter them repeatedly, on our way to something else. The body is not eaten, gathered up, skinned. No one keeps or uses any part of the creature. Like all the dead birds and animals along our roads and highways, they end up road kill. Public trash. There is one other way in which humans threaten the existence of squirrels, along with so many other wild animals: we obliterate their homes. Where there used to be woodlands, forests and meadows there is now the landscape of our human life: cement, brick and steel. The body of the baby squirrel was tiny and lovely—still warm. I had pulled over, and realized that a car just before me must have hit her. Here in a primordial forest, I was able to do more than move the brutalized animal into the grasses out of the road. I found leaves, pine needles, sticks and forest duff to cover her. My heart broke at the sight of her–beautiful, innocent and soft. I am so sorry, I said, brimming with unexpected emotion. The girl in me remembered what it was to be wounded by an overwhelming force—the invading hands of adults upon whom I depended. Oh wee one, my heart said to the little squirrel, I am so sorry. I know what it is to suffer, to have others avert their eyes from the mess of looking at you. I sat on a rock, the baby squirrel covered now—and put my hand above the little mound. A soft song rose in me, and I hummed a melody over her body. I wished the spirit of the little squirrel ease. To the extent I knew how, I offered my heart to her soul. I prayed that she relinquish her life in peace. I apologized for the excesses of my kind, and the brutal manner of her death. I prayed that the fabric of love around her be mended. As I prepared to leave, I noticed two large, beautiful pinecones sitting by the grave. I positioned them atop the little mound to form a great V, pointing upwards, open to the sky. The open chalice, the pubic triangle. A decorated grave. Now one last small bow. And the act was done. Rising sunlight streamed through the trees thirty minutes later as I walked through a majestic grove of giant sequoias, many over a thousand years old. The trees were massive–two hundred feet tall and thirty feet in diameter. I was within the hallowed quiet of a cathedral. I nestled myself within two giant sequoias coupled together. I wanted to look, just look. Above me, ravens and a circling hawk. A tiny spider crawled on my sleeve. Touching the bark of an ancient living being, I offered my heart. I entered the web. I was startled out of this reverie when a baby squirrel ran towards me, chirping and running fast. She skittered straight towards my lap, then veered up one of the twin sequoias, turned, looked at me, then skittered across to a nearby tree. There she stopped and turned and looked straight at me. My teacher had urged us to pay attention to the wild to animals who came towards us. I sat up. The baby squirrel stayed still as a statue, and looked at me searchingly. And I understood then, all in a moment, and irrevocably. She was expressing gratitude. She was thanking me for burying her kin. The squirrel was urgent with it. Gratitude. This was, I suddenly saw, an essential currency of all the beings in this forest. Gratitude–it is abundant, urgent, and necessary as breath. I sat back and looked at the baby squirrel, precisely like the one I pulled from the road just an hour before. The squirrel sat with me for a time before skittering on. I stayed nestled within the two sequoias for an hour or more, listening to the songs and birdcalls of the forest. Deep mounds of snow covered much of the ground along the banks of the Kauah River where I walked later that afternoon. White-blue waters roared down from white-capped mountains of the Sierras. The river was full with recent rains, everything pulsing with the giddy sense of spring. I settled on a dry spot under a tree, and sat by the river. Eyes closed, I set my head down on my backpack to rest and dream. I offered prayers for my family and for the other women on the Medicine Walk. I sat in silence with the river, who frothed and tumbled like a wild thing. Inside I was at ease. I had touched something quiet at the base of my heart. Then, impossibly, it happened again. A baby squirrel startled me, skittering towards my lap, chirping and squawking. Then he scurried up a nearby tree. Only ten feet away, he turned and looked directly to me. Our eyes met. He chirped, his tail swished behind him—his whole body pulsed with urgent communication. And I understood. I was again being thanked for my small act of burial that morning. But this perhaps was something more. It was generosity. A completely generous acknowledgement of my broken heart on their behalf. The young squirrel looked at me, chirping loudly. You’re welcome, I said. Now he chirped again, his tail swished, and again, the urgent look. I smiled. You’re welcome, I said again. Again and again I said, you’re welcome, as he continued to stare at me and chirp. Nine times through, this sweet and urgent currency was exchanged. I bowed at the generosity of his offering. Namaste, I said, speaking aloud the ancient Hindu greeting, I greet the god in thee. At that he ran further up the tree, turned and looked one last time. And scurried out of sight. In that moment I looked around the forest, stunned. Around me, the pines, sequoias and white firs had witnessed the entire unfolding between me and the squirrel. They were glad. It was apparent and plain. I turned around in a circle and exchanged something, I cannot say what, with each tree. It was a living embrace. If you can talk to squirrels and speak to trees, it seems to me you are saved. In that moment, my heart was redeemed. What I had done wrong could be made right. What I had forgotten could be remembered. What I had lost I could learn again. Within me and all around, I knew: not only the forest but also an essential energy of nature existed within an ongoing flow of gratitude and generosity. That is why the earth has evolved such beauty. The trees are generous and provide shelter and food to all the creatures around them. (And they are beautiful.) The animals live in interdependent kinship with the trees, expressing gratitude. (And they are beautiful.) Flowers blossom, offering nectar; now come the butterflies and bees, who feast, and pollinate. Giving and receiving. Any being, I came to see, who adopts the currency of gratitude and generosity as a way of life will, by definition, be beautiful. Regardless of whether the world is ugly or beautiful around them, they will be beautiful. This was my birthright: a way of being so deep within the energetic flow of the planet that I did not have to spend years learning it. I only had to remember, to sink within something that not only already existed in nature, but also within humans, for we are all of the earth. This currency is familiar to us. When we are within it, we feel right. After a time, a crow flew by. I picked up my backpack and walked slowly down the river path to my car. I had taken no drugs, no mind-altering substances. I’d eaten plainly for several days. But my hands on the steering wheel were transformed. I saw the wrinkles, the aging lines. I saw myself, a woman of graying hair. My movements were calm. I smiled at children as if they were my own. The beings I saw—humans, trees, river, even machines—were not alien to me. Nothing was made of anything that was different than what I am made of. No thing on the earth was the same as it had been before. My eyes were undimmed. I had become bright. The next morning I spoke the strange tale of the squirrels to our gathered circle. Valerie was silent for a moment. She is a woman with extraordinary understanding, and I’d come to trust her instincts. Still, her next words astonished me. She said she’d just been told my medicine name. She stood and put her hands on my shoulders. She said that the squirrels have been with me a long time. And that the spirits were telling her that my medicine name was Grandmother Squirrel. Well, no. It had never occurred to me to want a medicine name. I was not a shaman. I did not want to misuse someone else’s tradition. I was here simply to break down the walls within myself. But there was Valerie, eyes shining. She said that in the name was my long-relinquished kinship with the kind and beautiful creatures who had reached me in the woods. “I do not understand”, I said. I remembered the squirrels of my childhood from a long distance away. It was like looking through a portal into a time warp. I saw myself young and pudgy, rolling in grasses, singing in trees, whispering stories to the lovely little brown squirrels, with their bushy, enigmatic, delightful tails, their chattering stories. Too many blissful mountain experiences are followed by the jolt of returning to the killing fields of America’s highways. I drove through the foothills and into the towns, my shoulder greatly improved, a calm lightness in my heart. Barely out of the mountains I saw a bobcat lifeless at the side of a far lane. I pulled off at the next exit, turned around, and stopped across from him. As it happened, as I got out of the car there was a tattered road kill squirrel directly at my feet. Oh, it is difficult to care. The freeway in the mountain foothills was clear enough. I waited for a few barreling cars and trucks to pass, then ran across the lanes to the bobcat. She was frozen on her back, thick with rigor mortis, claws like daggers. Her teeth were bared. She’d attacked the monster that claimed her life, and died in that moment. Her eyes were open and fierce. I used a paper towel to pull her to brown grasses and reeds at the side of the freeway. I found myself humming one of Valerie’s prayer songs as I covered the creature with wisps of grass. I covered and prayed for the tattered remnants of the squirrel. It was right action and also a sad, strange, pitiful offering. As I drove home I prayed for each dead creature I saw along the roads. There were far too many, and the freeways too dangerous, to stop for each one. Most were squirrels, but there was also a deer, a raccoon, a skunk. Seeing the violent end of their lives was a burden, and also a grace. Acknowledging the death and sending a prayer each time meant that I was in prayer my entire journey home. On an empty road closer to home, I saw yet another dead squirrel in the middle of the lane. I pulled my car over. The squirrel’s body was warm as I carried her out of the road. I could feel her body pulsing. I choked with grief, then walked away for a moment. I looked for a place to lay her, checking for leaves, brush, sticks and grasses for a ritual burial. The paved asphalt touched a wall at someone’s land or home. There was only cement and dust all around me. I returned to the squirrel. It appeared for a moment that she was breathing. Of course it was impossible: I had just pulled her lifeless body from the road, and the blood trail that followed her led to a great red gash in her side. But from where she lay, peacefully now, out of the thrall of cars, she could appear whole. I looked around again. She could not remain here, where cars would only come again and again until she was annihilated. I wrapped her in paper towels and put her in a small box in my car. When I brought her inside later that evening, the paper towels were covered with bright red blood, like a woman’s menstrual napkin. She was still bleeding slightly as I laid her upon a cloth in my room. By instinct I surrounded her with redwood cones, pine needles and acorns. The squirrel was immediately restful—and beautiful. I gazed at the little ears, the whiskers, the elegant paws. Her eyes were half-closed. She was full-grown, mature, her tail long and full. I was aware of the honor to be so close to this creature, to be allowed to gaze upon her beautiful lashes and soft fur, the perfection of her physiology, how entirely suited she was to her life. Again, it seemed she was breathing. I had laid her out on her untouched side, where there was no massive gash from a car. It was undeniable that the pulse of life was still with her. She was still relinquishing her life. 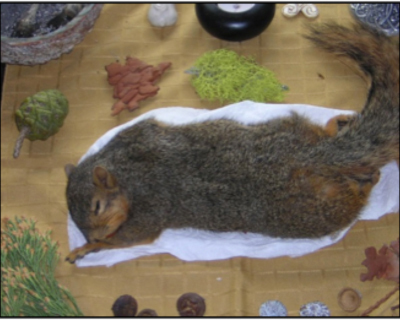 The next afternoon, my wife Jean returned home from teaching school to find that I had not yet buried the squirrel–who was, even then, lying in ritual state up in my room. Jean knelt by the table. When I woke the next morning, the squirrel was ready. Her body had flattened in the night. She had completed her dying. I took sequoia needles and pinecones and placed them over her body. I lay an acorn over her eyes. Now on my table she wore the energy of the restful dead. I dug a grave in our garden and cleaned out leaves and twigs. Just before the burial, I considered keeping some part of the squirrel with me as remembrance. I knew that humans have used parts of animals for millennia, as we obviously still do now for the leather shoes and gloves I wear. Still I was unsure. I asked permission, and felt an assent. With a small knife I cut her tail and two paws. It was gritty, but familiar and ancient. I found myself softly humming a prayer as I placed her still-soft body in the earth and surrounded her with acorns and pine needles from oak, eucalyptus and sequoia trees. I sprinkled holy water from the sacred well of Brigit in Ireland. I closed the grave, and the earth took her. For a marker I put a colorful mosaic stepping stone an artist friend made years ago. I sat in the garden by her grave. Just sat, looking at apple blossoms and a honeybee. I looked at the sky, and the birch tree. I looked. The entire earth was strung together. I could feel it; I was of it. This was the field of love, mended. This was what was possible. The squirrel buried in my garden must have been a grandmother many times over. Squirrels mate and bear young the first year of their lives. If she lived her life expectancy of about five years, there were four generations behind her. I wonder about her paws and tail in my room. I know this is an ancient human practice, yet there was nothing in my experience, or my urban childhood, which spoke of this. As a girl I was told that squirrels didn’t matter, neither did crows, hummingbirds or the bright red cardinals in our yard. They were decoration, background. The natural world was lovely, but it was also angry and rough; it had no actual soul. Only God lived and was sacred, somewhere in the sky. The stuff around us was landscape, or resource. The animals, trees and plants were there for the taking. We needed food, wood, fur skins. Feathers for blankets. Leather for shoes and coats. Steaks for our plates at dinnertime. These things had no spirit to them, no ancestors, no soul life. Use what you wish and make no thanks. Did keeping the paws and tail enhance the sacredness of her life, or degrade her in some way? What does it mean to keep the hair or teeth or bone of a creature? Of someone we love? Instead of burying Grandmother Squirrel, what if I had done as our human ancestors have done since time immemorial, and skinned and eaten her? I know a woman who has lived in the redwood forest for forty years. She built her small cabin with redwood from the nearby trees, who are her long-time companions. Two living trees literally hold up one end of her small house. When I asked her about this, she smiled and said that trees wish to be of use. They do not wish to be overused or taken without gratitude. But when done with thanks and for good purposes, yes, she said, trees wish to be of use. As I considered it, this was not so selfless really. In the end, isn’t this what we all want? We want our lives to be of use, to have made a contribution. Generosity. The wish to be of use. Gratitude. The urge to offer thanks. That is the energetic flow at the core of the earth that the squirrels and the forest showed me. This is what humans have somehow lost in relation to the earth. When the indigenous peoples of America hunted animals, it was done within a circle of giving and receiving—generosity and gratitude–wherein humans made offerings and gave thanks to the animal herd that provided the very sustenance of their lives. When modern life came to America, animals began to be killed in a soulless way. Today billions of animals die each year in factory farms. It goes without saying that these creatures and their life force–that they suffer and love, bond with others and feel pain–are not honored or even acknowledged as real. Yet most of us depend upon these animals for our own vitality and growth. I come from that great wave of light-skinned Europeans who journeyed to North America and began the end of one way of living with this land and the beginning of another. Still, the ancient way of human communion with animals was once lived by all of our ancestral kin, on every continent. In the long history of the Earth, homo sapiens lived not very long ago within the open savannah, among other animals, in the world of the hunter and the hunted—that is, the eater and the eaten. Humans, like all the other animals on the planet, know in our deepest cells what it is to be prey. We have clawed our way to the top of the food chain, but is it so awful, really, to give oneself over to someone else’s life? Is it not true that what is eaten is taken into the body, and in that way continues to live? If I am buried in the ground in a plain wooden box, which is my wish, my body will be eaten by microscopic creatures who will turn me into loam and rich soil. Isn’t this the essence of the Catholic sacrament of Holy Communion, an act that was adopted by my Irish ancestors and part of my own family upbringing? Does not the eaten become the eater—literally the stuff of which cell, skin and bone are made? Is there any way to truly name the end of the chain? Somewhere deep in the bones of each human lie the remnants of our shared life with the great tribe of earth animals. This epic relationship has been lived over many millennia of human evolution. It is too deeply indigenous to humanity to be entirely wiped out. Squirrels long predate humans on the earth, and are among the more ancient of any species. They have occupied the earth in their current form for thirteen million years. Humans have been here in something close to our current form for four million years. These generous and intelligent squirrels are much, much older than we are. They have known this earth a very long time. Now the tail and tiny furred paws sit quietly on an altar in my study. I did not eat her, as my human kin have done for millennia, though some part of me wishes I’d had the simple knowledge of my ancestors to skin her, bless her, and take her all the way in. I’m grown up now, but over the years I have also grown a little down. That girl who knew that there was no separation between herself and the rest of nature still lives. It was she who sat in the forest and felt the living, ensouled beings around her. It was she who could touch for a moment the currencies of the natural world: generosity (nature’s tendency to share, to give food and to offer shelter) and gratitude (the reciprocal urge to offer back, to acknowledge that we depend upon each other to live and grow). Carl Jung once said that the meaning of his existence was that life had addressed a question to him, and that he must answer it or risk having it answered for him. In the forest that day, the question of my life began to be formed: how to become such a self, generous of body and heart, grateful of being and action? How to live with the rest of the non-human world as kin? The question is always with me now. Like the name I was given, it is a path. It echoes like a prayer. In my very holding of this question, there lives an answering call. I see the generosity of the bee in my garden, spreading pollen that keeps the plants flowering–and which is also the bee’s own feeding, its communion, and its need. The currencies are a cycle, like alternating currents. Generosity becomes gratitude, hunger becomes offering, taking can simultaneously become giving. Such is the hum at the center of our world. Somewhere, someone named Grandmother Squirrel nods and smiles. Deep within, a small girl turns. She is lying in the grass, talking to bees. She thinks the name I was given is simply a very good name. I go outside and touch the earth. I reach into the soil and plant seeds. Some of these seeds the birds will eat. Some will become my dinner. I bow my head. I say, Thank you. Carolyn Brigit Flynn is a poet and writer dedicated to language as a pathway to soul and spirit. Her poetry collection, Communion: In Praise of the Sacred Earth, is her offering of love poems to the sacred essence of the Earth, addressed as Beloved. She is the editor of Sisters Singing: Blessings, Prayers, Art, Songs, Poetry and Sacred Stories by Women, and The New Story: Creation Myths for Our Times. Her poems and essays have appeared in literary journals and anthologies nationwide. 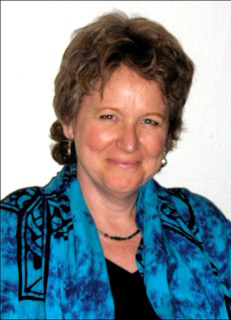 She teaches writing groups and retreats called Writing to Feed the Soul in Santa Cruz, California and in Ireland.